Hey la-di-da-di, we like to party! I’m Dotty, but my friends call me Da-Di ’cause I like to PA-DI! 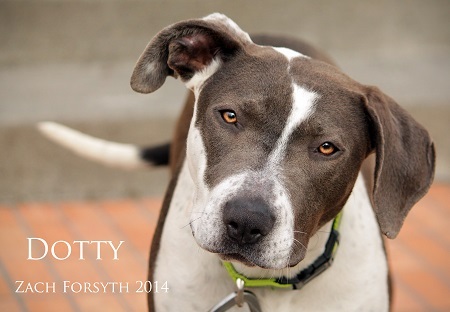 I’m a pit mix who loves staying up late, hanging with my friends, sleeping ’till noon and rockin’ out to old school hip-hop and the latest and greatest on the electronica scene. I’m young and super social, so the party-all-the time lifestyle is no big thing for me. In fact, I prefer it! I love hanging with my posse made up of other dogs, cats, kids and anyone else who just wants to have a gooooood time. I’m 11 months old, so they tell me I need to go to school- puppy school! I’m told it will only enhance my social life, so I’m all for it. They also tell me it’s mandatory if someone wants to take me home. And don’t get me wrong, even a young girl like me needs a little down time to get ready for the next rave. I love to snuggle and I’m great just chillin’ in my crate. Am I the lovable party girl you have been dreaming of? Fill out the application at pixieproject.org so we can schedule a meet and greet! Oh! And I’m vaccinated, spayed and microchipped, and crate trained. My adoption fee is 250.